Millions of professionals use consumer cloud services in order to access files from any device and share them with colleagues, customers and partners. This has created huge productivity increases and allowed users to work from home or any place they like. But all these cloud stored documents are starting to becoming a major concern for many CIO’s of companies. Customer information and trade secrets are just one click away from competitors access and often transit in a non secure way over the internet. ContactOffice groups are secure shared work spaces accessible only to selected ContactOffice users. The access to such a group is on an invitation-only basis. The shared work space is present in the following ContactOffice tools: Calendar, Documents and Addressbook. Once users are members of a group, they can only access the data that is shared by the administrator of the group. They cannot delete, add or modify data. However, the Administrator of the group can also assign access rights per tool and per folder to selected member of the group in order to allow them to add, modify or delete group data. He/she can also create co-administrators. ContactOffice groups are a great way to share documents in the cloud securely because the documents, calendars or contacts do not leave the servers via email or non-secure links. They remain stored on our server and do not need to be sent as attachment to a mail or as downloadable hyperlink. Users are notified by email whenever new documents are added in a shared work space. They can then view the data with their secure https connection. Administrators can at all time edit, comments or tag the documents and define specific access rights per document. You can create a new group that would only contain this other user and yourself. However this might be an overkill if you only need to share this one document with this user. 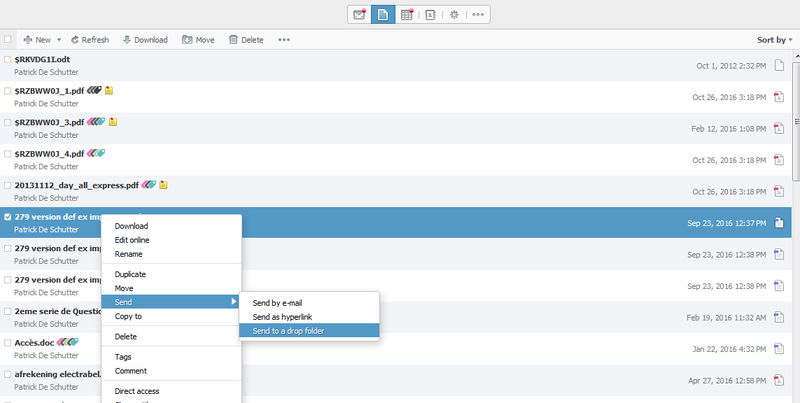 You can use the ContactOffice “Drop Folder” function. This function allows you to send/deposit the document in the account of the other user, without it ever leaving our servers. And without infringing on the privacy of the other users. It is a bit like an Inbox for documents. How does this “Drop Folder” function work? Next story Social Engineering: What is Phishing?